On May 4 when I opened up my Google for…well, whatever reason, there was a Doodle of a little lady with giant glasses among city buildings. I was curious and clicked on it. The Doodle was in celebration of the 100th birthday of a woman named Jane Jacobs. As I read, it occurred to me that this woman, while not a “Mormon,” was definitely a “Mommy” and most assuredly a “Writer”—and as I had just written a piece about “standing up and speaking out,” she was an example of someone who bravely did just that, and inspired change that I’m sure even she didn’t imagine she would affect. Jane Jacobs was a self-taught journalist living in Greenwich Village in New York. 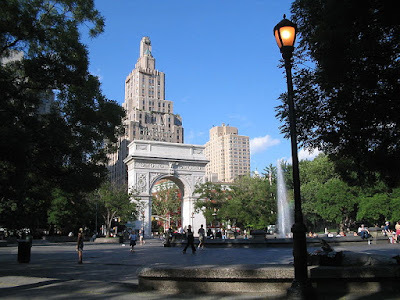 The short story is that an extremely powerful man, Robert Moses, had made plans to demolish the iconic Washington Square Park in order to build the Lower Manhattan Expressway. There were various plots and plans to build different roads and high-rises, demolish neighborhoods, etc., to push all of this through (I am simplifying the story for space). Jane organized grass-roots efforts to block these developments, because she believed that neighborhoods should be a mix of old and new, business and residence, instead of buildings and roads just designed to move cars from place to place. From writing letters to government officials, articles in magazines and newspapers, and a book that has since become standard reading for architects and planners (THE DEATH AND LIFE OF AMERICAN CITIES), Jane made people aware of a better way for the city to be more livable. Then she started mobilizing people. She spearheaded grass-roots efforts to protest and attend planning hearings and other meetings. She got government officials on her side that were not in the pocket of power-broker Moses, and sure enough, through her efforts, Mr. Moses and his plans were blocked multiple times. During one of the hearings, Robert Moses threw a temper tantrum as he realized his plans were about to be thwarted. According to an interview Ms. Jacobs gave to Metropolis Magazine in 2001, Roberts said, "There is nobody against this—NOBODY, NOBODY, NOBODY, but a bunch of, a bunch of MOTHERS!” and then stomped out. (1) That “bunch of mothers” kept an expressway out of Washington Square park. Jane and her husband knew that their sons were approaching an age where they would either have to become criminals, or fight in a war (Vietnam) that their family deeply opposed. In order to spare them having to make that decision, her family moved to Toronto Canada, where she lived until she passed away in 2006. She remained active as a writer, in politics as a community organizer and in protecting neighborhoods there as well, and was selected to the Order of Canada for her contributions. Her legacy lives on—Google her if you want to read about some of the contributions of this fascinating woman. The thing that touches me the most is that while Jane Jacobs did attend college for several years, she never earned a degree. She wrote seven books and countless magazine articles which are still studied today. Jane’s Walk is a series of neighborhood walking tours. Named after urban activist and writer Jane Jacobs, Jane's Walks are held annually during the first weekend in May to coincide with her birthday. Jane's Walks are led by volunteers, and are offered for free. The walks are led by anyone who has an interest in the neighborhoods where they live, work or hang out. They are not always about architecture and heritage, and offer a more personal take on the local culture, the social history and the planning issues faced by the residents. Since its inception in 2007, Jane’s Walk has happened in cities across North America and around the world. In 2014, over 40,000 people took part in a Jane's Walk led by volunteers in 134 cities across 6 continents. Cities that have participated in Jane's Walk include Calcutta, Calgary, Halifax, Lethbridge, Ljubljana, Montreal, Ottawa, Perth, Sudbury, Toronto, Vancouver, Victoria, Waterloo, Kitchener, Windsor, Winnipeg; Anchorage, Boston, Chicago, Dayton, Detroit, Honolulu, New Orleans, New York City, Oakland, Oklahoma City, Omaha, Orlando, Philadelphia, Phoenix, Salt Lake City, San Francisco, Seattle and St. Louis. In 2009, a walk in Mumbai, India was added. In 2011 the first Jane's Walk in Madrid was held. In Slovenia Jane's Walk was organized in 8 cities in 2012. The organizer, Institute for Spatial Policies, also published a manual how to prepare and organize the event. All of this, because a MOTHER (and a WRITER) wanted to save her neighborhood. She believed it was right, and she stood up, and spoke out. How powerful! I hope this story has given you a little inspiration to use your own talents and gifts to make YOUR own corner of the world a better place. You never know how far YOUR ideas can spread! I have actually read The Death and Life of Great American Cities, because my bachelor's degree is in Historic Preservation and it was required reading. I even remember the paper I wrote on it, because it was for a professor who was notoriously tough on students (she was also a lawyer) and I got an A. And I remember that this professor wrote some really great insightful comments and questions on my paper that made feel really good about my work because it was clear that she respected my ideas enough to start a dialogue with me about them.